Version 4.2 introduced a face detection with auto cropping module into all programs with Images Mode (and Main Mode of OutPost). With the module it is possible to crop images, in bulk, to a common position and size. 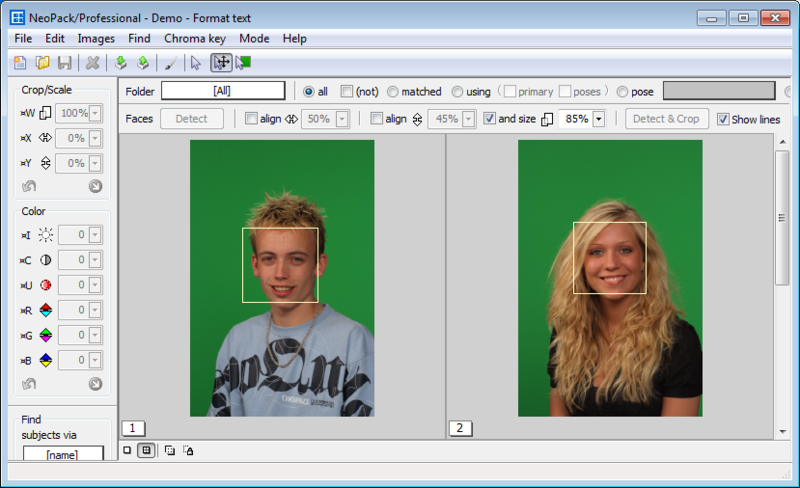 The face detect tools are available in their own toolbar immediately the 'Crop Image Tool' is used. 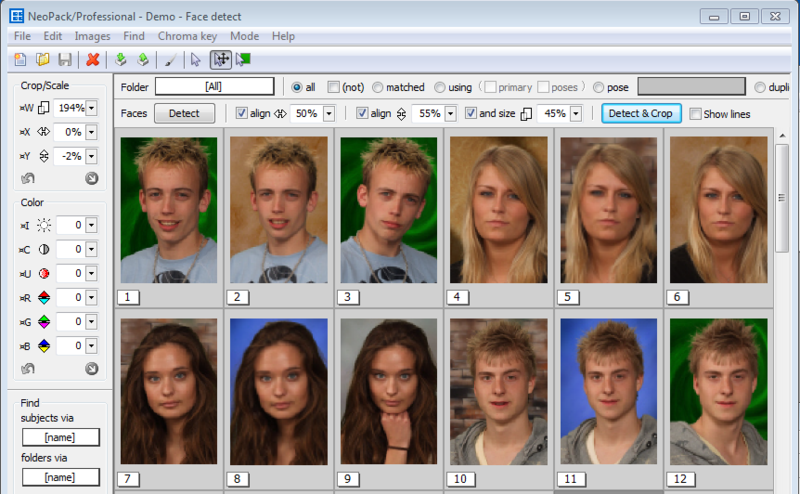 It is envisaged that possibly the best way to use the new face detection tool is to jump straight in with some default values and learn from the results. The face detection algorithm finds the eyes, nose and mouth of a face in the upright position. For this reason images where the subject is horizontal (regardless of whether the image itself is in the portrait or landscape orientation) or where the subject's head is tilted at a significant angle cannot be used. Figure 3: Face detection indicated by a square box. The purpose of the face detection algorithm is to then enable automatic cropping of images so that faces are a consistent size and position . To this end three adjustments are available. The three parameters above are set with the corresponding tools on the Face Detect toolbar and are expressed as percentages of the total canvas. With respect to horizontal alignment the start point is deemed to be the bottom left corner of the canvas with 100% being the extreme right had side of the canvas. A value of 50% will therefore place the centre of the face midway along the x axis. A value of 75% will place the face three quarters of the way along the x-axis and so on. With respect to vertical alignment the start point is deemed to be the bottom left corner of the canvas with 100% being the top edge of the canvas. A value of 50% will therefore place the centre of the face half way up the canvas. A value of 66% will place the face two thirds of the way up the canvas. With respect to size, the size of the face is expressed as a percentage of the total canvas area. A value of 40% indicates the face will occupy 40% of the total canvas and so on. 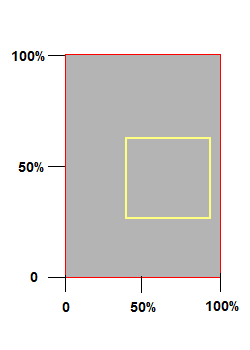 Note since the face is detected as a square and most images are rectangular a value of 100% is not possible..
To help with understanding the values it can be useful to remove the human elements as in the two following diagrams.